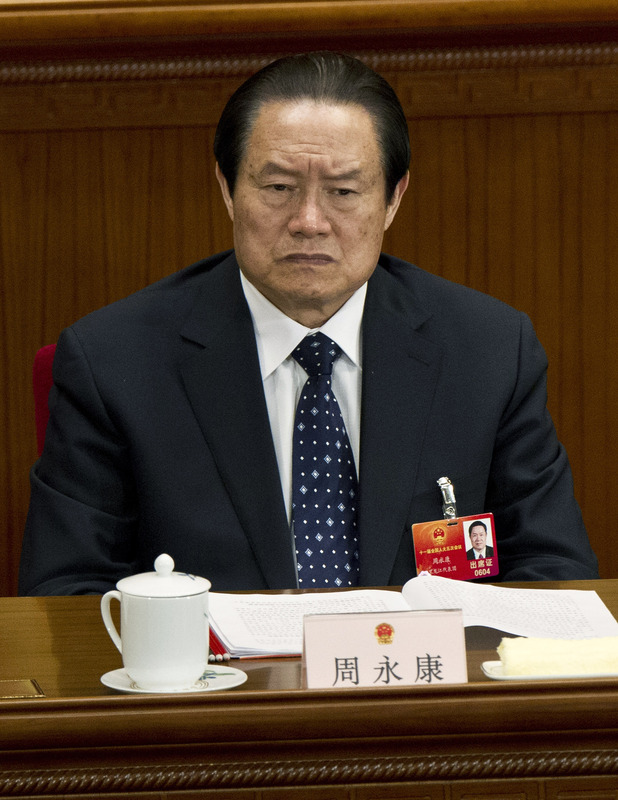 For the last several days I’ve been keeping an eye on rumors that China’s former security czar Zhou Yongkang might be in the crosshairs of the anti-corruption authorities. If Zhou were charged, it would be BIG. Until last year, he was on the Politburo Standing Committee (PBSC) – China’s most powerful body – where current and former leaders have been safe for the past four decades. Unreliable overseas Chinese rumor mills like Boxun have been reporting that Zhou’s downfall is imminent for more than a year-and-a-half, so I don’t tend to give much weight to these rumors. But now there’s good reason to suspect he really is in danger. He seems to be getting painted into a corner, as his allies are being placed under investigation for corruption one-by-one. It’s just been reported that Jiang Jiemin, head of the State Assets Supervision and Administration Commission (SASAC) and previous chairman of the China National Petroleum Company (CNPC), is on the chopping block. This is a very high official and a very close ally of Zhou’s. Before him several other officials from CNPC – China’s biggest oil producer – were placed under investigation. I remain skeptical that Zhou himself will be taken down. The government is just beginning to breathe a sigh of relief now that the whole Bo Xilai affair is over. Taking down Zhou would be unprecedented and would risk stirring up the pot again. However, it would make sense in a lot of ways. Xi Jinping has claimed he intends to go after both the “flies” and the “tigers” in his corruption crackdown. Contrary to what state media would have you believe with cases like Liu Zhijun and Bo Xilai, I would argue that a tiger has yet to fall. Bo Xilai was close, but he was a mere member of the 25-person Politburo. Its members have proven expendable for the past 15 years. Taking down a former PBSC member though would be a strong signal that indeed nobody is above the law (that signal wouldn’t reflect reality, but that’s irrelevant). Xi and his campaign would be given serious legitimacy. But more important, I think, is that taking down Zhou could actually have some practical effects. U.S. Embassy cables released by Wikileaks in 2010 appeared to confirm what many had long suspected: that some of China’s highest level leaders have extreme vested interests in certain monopoly industries. Li Peng’s family reportedly controls electricity, Wen Jiabao’s family the precious stones trade and Zhou Yongkang China’s oil monopoly (he used to head CNPC). Xi Jinping has made it pretty clear that he has little intention of launching serious political reforms. In lieu of that, he appears to be pushing some fairly serious economic reforms. But even that’s fraught with landmines. Serious economic reform requires breaking up, or at least dramatically overhauling these state-owned monopoly juggernauts that are controlled by some very powerful vested interests. Going after any of these industries is politically risky, but now that Xi has more-or-less consolidated his power, Zhou and his oil cronies offer a good first target. In March, after People’s Daily ran an attack piece on Apple called “Smash Apple’s Incomparable Arrogance” Caijing asked Chinese consumers in an online survey which arrogant company they’d like to smash. China’s big three oil companies were all voted among the top. The big oil companies have been very slow to invest in cleaner technologies because they haven’t really had to. In practice, they’ve had more power than the Environmental Ministry that’s theoretically supposed to regulate them. This no doubt comes in part from the industry’s powerful patrons. Many see the oil companies as largely responsible for the horrible air pollution in cities like Beijing. Indeed, more of Beijing’s local PM2.5 pollutants come from vehicle emissions than any other source. Then on the other side, you have people who despise the inefficient and highly-corrupt oil monopolies for making gas prices higher than they need to be. Going after one of China’s top oil companies and its patrons sends a message that business as usual for vested interests won’t be tolerated like it has been in the past; and that if reform comes a knockin’, these vested interests better not stand in the way. That message might already be working. As all these CNPC executives started being placed under investigation, Sinopec, one of China’s other big three oil companies, announced it would be upgrading its fuel standards three months ahead of schedule. Then there’s Zhou Yongkang himself. South China Morning Post said taking down Zhou “could send even bigger political shockwaves through Beijing than the trial of Bo Xilai,” but I don’t think so. You’d be hard-pressed to find a more hated leader than Zhou – the man who was at the heart of China’s violent and frequently law-breaking “stability maintenance” apparatus. Bo Xilai was a high-profile populist leader who had a lot of detractors, but also a lot of fans. Zhou Yongkang on the other hand quietly and ruthlessly ran China’s security apparatus with an iron fist. If someone in China knows enough about Zhou to have an opinion about him, that opinion is almost certainly negative. Zhou probably doesn’t have many supporters within the government either. Allegedly, because he supported Bo Xilai and had overseen the security apparatus so recklessly (and incompetently. See Chen Guangcheng), Zhou was forced to informally give up most of his powers months before he formally retired. If this is true, it’s unlikely he has many high-level friends left that would stick their neck out to protect him. The writing has been on the wall for some time now that Zhou could be a political pariah. It’s doubtful that Xi would face too much resistance in taking him down. Again though, as many good reasons as there are for targeting Zhou, I’m still pretty skeptical that it will actually happen. The Communist Party is very risk-averse and Xi could still accomplish a lot just by dismembering Zhou through his allies rather than beheading the man himself. If it does happen though, don’t get your hopes up for any other high leaders to follow. Nobody else at the top is nearly as vulnerable as Zhou. And if Xi starts picking off multiple officials who were thought to be above reproach, it’ll spook a lot of powerful people. Xi could then become the one with a target on his head, and not necessarily a figurative one. It appear Xi is taking a page out of Deng’s playbook, doing his thing without drawing to much attention to himself. I think Xi ‘s overall plan is good for China at this point in time. He has ten years to make his mark. How can he ‘stay’ or ‘go?’ He is formally retired. It’s “Staying out” or “go to jail”. A great article. Thanks for posting it. I’m pretty excited to see if any of the big tigers will get attacked during the next few years. It could really set an interesting tone for the rest of the Xi Jinping/Li Keqiang years. Well it looks like Xi has cooked Zhou’s goose now…..it just took a little longer to do. until a thick consistency ‘ add a couple of eggs and sage to taste. The Engineers did not figure out how this happened.